All the candidates awaiting admission to DNB courses for July 2018 session must pay attention. The counseling schedule for DNB (Post MBBS) & DNB (Post Diploma) courses for July 2018 admission session has been released. 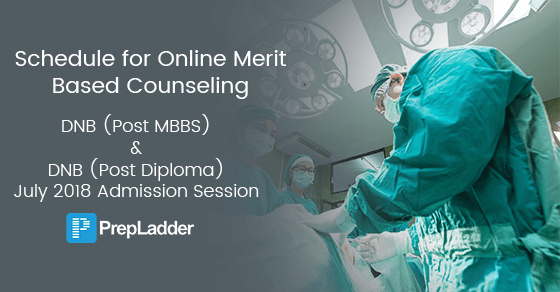 Participation in the online Counseling shall be strictly as per the eligibility criteria and guidelines mentioned in the Information Bulletin for DNB CET July 2018 and Handbook for admission to Diplomate of National Board Post Graduate Courses (Post MBBS) July 2018 Admission Session and Handbook for admission to Diplomate of National Board of Post Graduate Courses (Post Diploma) July 2018 Admission Session. Please note: Allotment of seat in the Counseling is subject to candidates being eligible in all respects and verification of their original documents during the counseling process. Candidate allotted with a seat during the counseling process required to deposit 1-year no0n-refundable Course Fee of Rs. 80,000 to confirm the allotment. The Indicative seat matrix shall be uploaded on the website on commencement of online counseling.